Honey is bee food. Though adult honey bees eat nectar and pollen from flowers during the summer, juvenile bees (larvae) eat only honey. 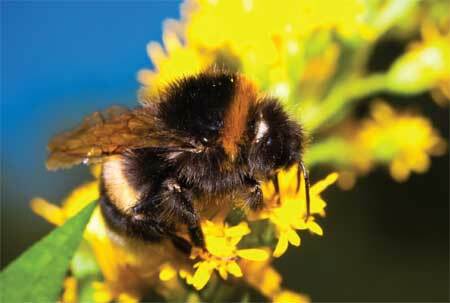 When winter comes and nectar is harder to find, bees rely on stored nectar to survive. Left in its natural state, stored nectar would ferment. In order to store the sugars in nectar in a usable and efficient state, bees convert the nectar into honey. The actual process of transforming the flower nectar into honey requires teamwork. Older workers do the foraging and bring the nectar back to the hive. There, younger hive bees complete the task of turning it into honey. First, worker bees fly out from the hive in search of nectar. Nectar contains about 80% water and complex sugars. Bees collect the sugary juice from the blossom by sucking it out with their straw-like proboscis (elongated sucking mouthpart). They store the nectar in a special stomach called the crop, which is separate from their personal stomach. Within the crop, enzymes break down the complex sugars of the nectar into simpler sugars. When the bee has a full crop, it flies back to the hive. The digested nectar and bee enzyme solution is then regurgitated from the mouths of the forager worker bees into the mouths of hive bees. The hive bees reduce the moisture component of the mixture by ingesting and regurgitating it. Then the concentrated nectar is finally deposited as a thin film on the honeycomb. Even more water is evaporated from the nectar as the bees furiously flap their wings. As the water evaporates, the sugars thicken into honey. By the end of the process, the nectar only contains about 20% water. Then the bees store it in honeycomb cells, which are like tiny jars made of wax. They seal the cell with a wax lid to keep it clean, so they can eat it later. It takes at least eight bees all their life to make one single teaspoonful of honey. Viscosity is a measurement of a fluid’s resistance to change, or more simply put, how thick it is. Some liquids are more viscous than others. For example, honey is more viscous than water. Can you imagine trying to swim in a pool of honey instead of water? Honey’s viscosity depends upon the amount of water and the type and amount of sugar it contains. If the concentration of water is increased, honey becomes less viscous. Clean the marble so we don’t waste the fluids. Make two marks on the outside of the tall container, one an inch from the top and one an inch from the bottom. We will use these marks as a starting point and end point to start and stop the stopwatch. Fill the container with one of the liquids to the starting mark. As you fill the containers notice how easily the liquid pours. Can you use this information to make predictions about how viscous each liquid is? Take the clean marble and drop it in the liquid and observe how long it takes to fall from the starting line to the ending line. (i.e. start the watch as it passes the first line and stop it as it passes the second line). After each drop, retrieve the m arble with the spoon and clean and dry it ready for the next run. Do the marble drop 3 times for each fluid. 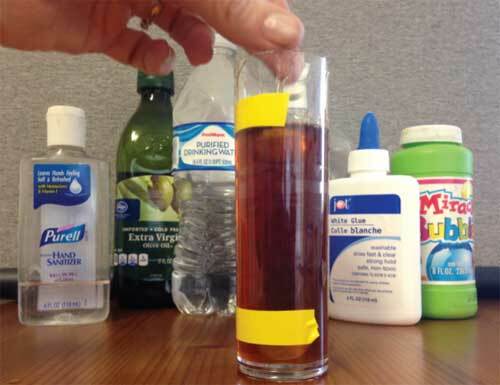 Record your results and compare the viscosity of the liquids. For further research: Do all containers of honey have the same viscosity? How do chickadees and sparrows (and other birds who stay in Idaho all winter) find food? It’s incredible how they have naturally been able to this process, and inadvertently have become so vital to agriculture. All from bees just trying to make food.